The crypto exchange Binance was launched on July 14th in 2017. The company is located in Shibuya-ku, Tokyo. The name of the exchange is a portmanteau of the two words “Binary” and “Finance”, which they combined to “Binance”. Due to the great community trust, the exchange is rapidly growing. They offer Two Factor Authentication (2FA) to secure your account. Further, they offer you guides that explain how you can trade cryptocurrencies on a secure way, which includes tips to your own systems security. As a personal suggestion and unrelated to this particular exchange, I strongly recommend that you use cryptocurrency exchanges only for trading certain amounts and not to store value over a long period of time. This should be common sense and counts for every exchange! Never store your valued coins on an exchange, do use a secure software wallet, or even better a hardware wallet instead! The deposit and withdrawal page supports all kind of cryptocurrencies. Of course the larger and very popular cryptocurrencies but also newcomers. You can find the page if you click on “Funds” at the top of the page and then on “Deposits Withdrawals”. Deposit is free but there is a withdrawal fee for the individual coins and you can find an updated list at their support page. The trading fee is 0.1% but if you own BNB (their own Binance coin), you can choose BNB to deduct 50% of the trading fee (however this seems to be a temporary offer and could end some day). At the time I write these words, Binance has a trade volume of $4.049.503.365 USD. All major cryptocurrencies are supported but many smaller or newer coins as well. They do regularly add new coins which is a big plus of the exchange as well. Talking about the Binance trade volume and the listed cryptocurrencies, you can check out Coin Market Cap to get an up-to-date impression. At the time I write this post it’s possible to use the site without verification, but if you want to, you can also go through the verification steps and increase your level. Verified accounts can withdraw 50BTC per 24 hours. Non-veritified account can withdraw 2BTC per 24 hours. They offer a basic exchange experience and a more advances version and you can switch between both depending on your needs. One really interesting feature is that you can choose your favorite cryptocurrencies. They do offer a BTC, ETH, BNB and USDT tab, and one that they called “Favorites”. When you click on a currency pair in the list, you will also see a tiny star on the side of it that you can click and this is how you add your favorite currency pairs to the tab where your favorites will then be visible. In the list you can show the percentage change or you can choose to show the trade volume of the individual pairs. With the ability to sort by pair, price, volume or change you get a great tool to find interesting coins or to monitor what is going on. Further you can trade limit, market and stop limits. Apart from the currency pair window, you get everything what you need on an exchange. You get candle stick charts with the most important indicators and of course you can change time period of the charts, and further you can also access a depth chart. This is where the difference between the basic and more advances window will be visible. Of course, if you need more data, you will want to choose the advances feature, if you want to see less you will probably like the basic feature. You can access them both by clicking on the “Exchange” button at the top of the site, and then you will see both “Basic” and “Advanced” as menu entries. I think the great usability of the site is one of the reasons of the rapid growth of this exchange. 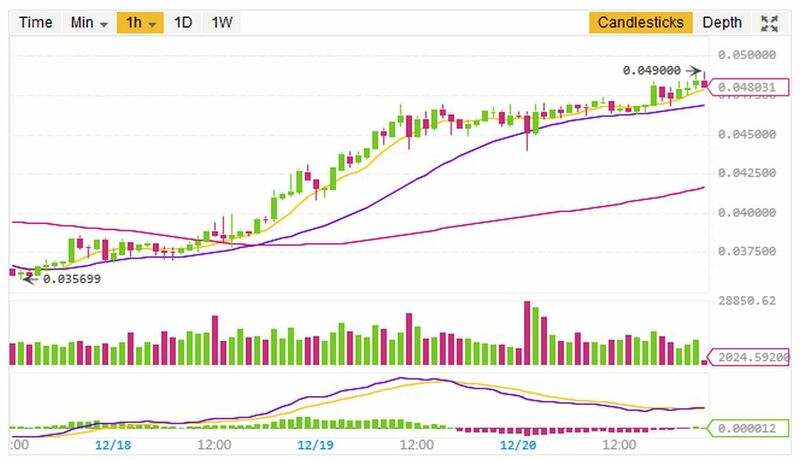 You might want to check out Binance as well to get an impression. If you think I missed important details or if you just want to discuss the subject, check out my comment section. I also want you to know that all the links to Binance are referral links, which means I would get a provision if you register through one of my links. I say that because with my articles I want to stay fair. If you don’t want to be referred by me, simply visit Binance.com instead. But I want you to know that I never write reviews about anything that I don’t use myself, and that it doesn’t cost you anything to be my referral. With that said, if you want to support me, please use my Binance link. Happy crypto trading!